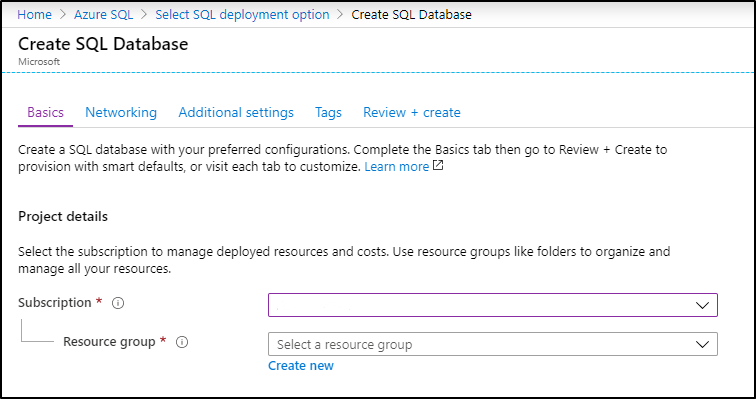 Creating a single database is the quickest and simplest deployment option for creating a database in Azure SQL Database. 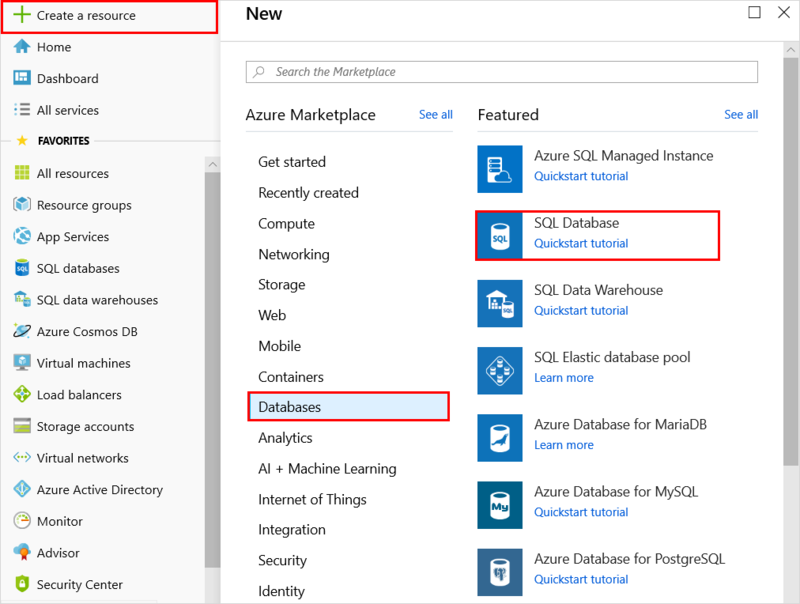 This quickstart shows you how to create and then query a single database using the Azure portal. For all steps in this quickstart, sign in to the Azure portal. A single database has a defined set of compute, memory, IO, and storage resources using one of two purchasing models. 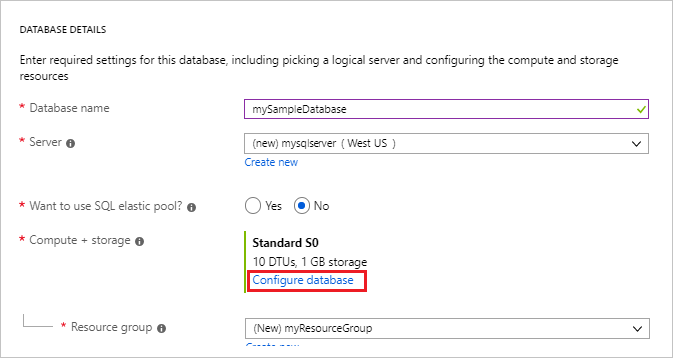 When you create a single database, you also define a SQL Database server to manage it and place it within Azure resource group in a specified region. Select Databases and then select SQL Database to open the Create SQL Database page. Subscription: Drop down and select the correct subscription, if it doesn't appear. Resource group: Select Create new, type myResourceGroup, and select OK.
Server: Select Create new and enter the following values and then select Select. Server name: Type mysqlserver; along with some numbers for uniqueness. Server admin login: Type azureuser. Password: Type a complex password that meets password requirements. Location: Choose a location from the drop-down, such as West US 2. Remember to record the server admin login and password so you can log in to the server and databases for this and other quickstarts. If you forget your login or password, you can get the login name or reset the password on the SQL server page. To open the SQL server page, select the server name on the database Overview page after database creation. Want to use SQL elastic pool: Select the No option. Compute + storage: Select Configure database and for this quickstart, select the Standard service tier, and then use the slider to select 10 DTUs (S0) and 1 GB of storage. Select Apply. This quickstart uses the DTU-based purchasing model, but the vCore-based purchasing model is also available. 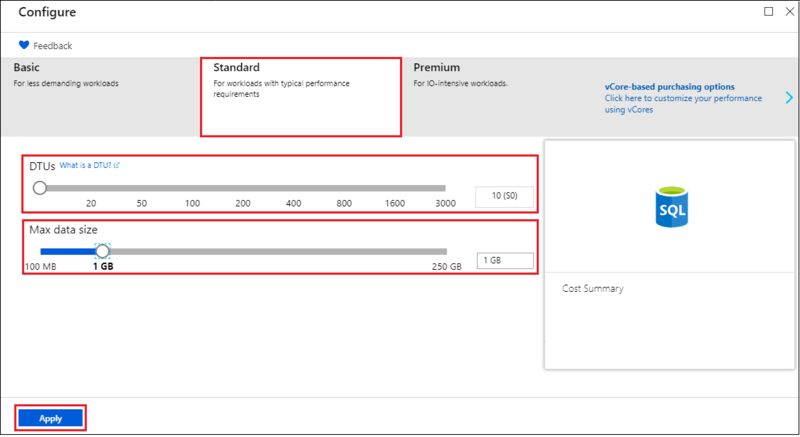 More than 1 TB of storage in the Premium tier is currently available in all regions except: China East, China North, Germany Central, Germany Northeast, West Central US, US DoD regions, and US Government Central. In these regions, the storage max in the Premium tier is limited to 1 TB. For more information, see P11-P15 current limitations. In the Data source section, under Use existing data, select Sample. 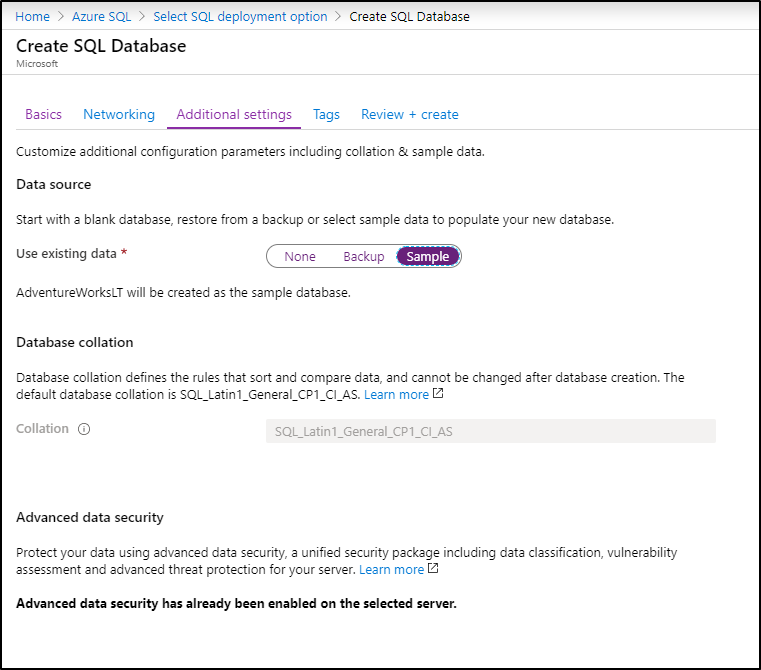 Make sure to select the Sample (AdventureWorksLT) data so you can follow easily this and other Azure SQL Database quickstarts that use this data. Leave the rest of the values as default and select Review + Create at the bottom of the form. Review the final settings and select Create. 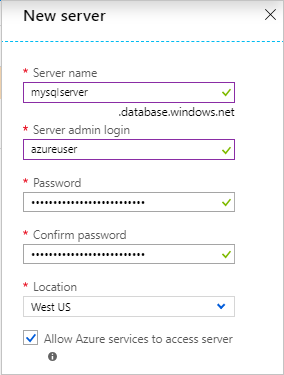 Now that you've created the database, use the built-in query tool in the Azure portal to connect to the database and query the data. Enter the following query in the Query editor pane. Select Run, and then review the query results in the Results pane. Close the Query editor page, and select OK when prompted to discard your unsaved edits. Keep this resource group, database server, and single database if you want to go to the Next steps. 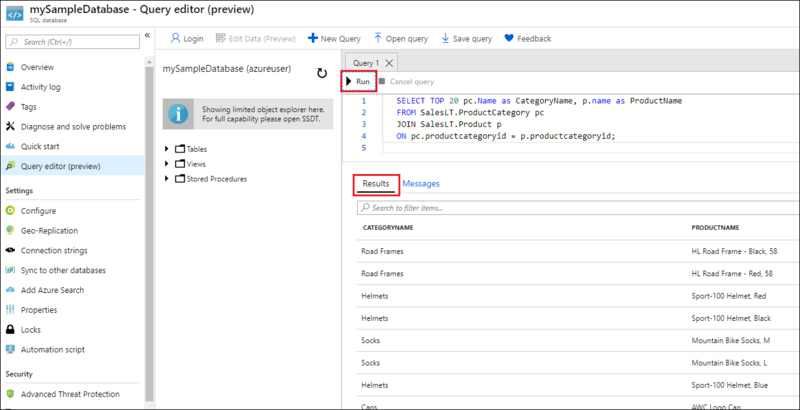 The next steps show you how to connect and query your database using different methods. From the left menu in the Azure portal, select Resource groups, and then select myResourceGroup. On your resource group page, select Delete resource group. Enter myResourceGroup in the field, and then select Delete. Create a server-level firewall rule to connect to the single database from on-premises or remote tools. For more information, see Create a server-level firewall rule. After you create a server-level firewall rule, connect and query your database using several different tools and languages. To create a single database using Azure CLI, see Azure CLI samples. To create a single database using Azure PowerShell, see Azure PowerShell samples.